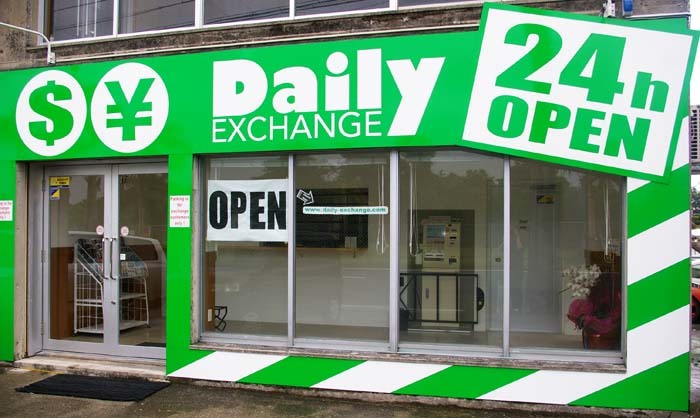 Daily Exchange shop is the first on Okinawa to be open for service 24 hours a day, 7 days a week. There are many currency exchange shops around Chatan and Okinawa City, and a new one seems to open almost daily. That has made the life very convenient from the days one had to visit a bank to exchange foreign money to Japanese yen or vice versa, and the banks had the ‘bankers’ hours’, too, not to mention the fee. 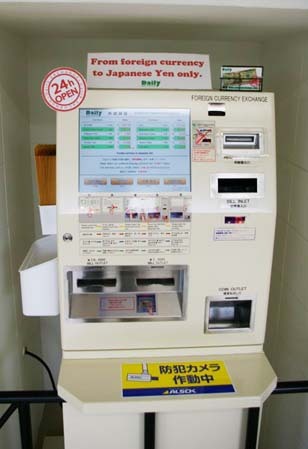 The ATM accepts 12 currencies for exchange into Japanese yen. In Okinawa, many people don’t use credit cards and prefer to pay in cash every time they shop or go to a restaurant. Maybe it’s because many places, especially smaller ones, don’t accept credit cards or people are afraid what happens if they lose the card. Many are also suspicious of the monthly payment and think it’s more secure to use cash. Some small restaurants and shops only accept Japanese yen and only a few take U.S dollars. This has been a problem, as many foreigners are accustomed to using credit card or only have U.S, dollars. However, there’s now a 24-hour exchange where you can change your dollars or other currency to Japanese yen any time of the day, seven days a week. A currency exchange shop named Daily Exchange that opened its first shop that operates 24 hours a day. A staff is present at the shop from 10:00 to 18:00 but an ATM is open around the clock, 7 days a week. The machine exchanges U.S. dollars and Euro and currencies of 10 other countries of Korea, China, Taiwan, Hong Kong, Indonesian, Thailand, Singapore, Philippines, Australia and England, to Japanese yen. Daily Exchange is located close to Kadena AB Gate 1. There’s a green building after a right turn on Hwy 58 from the gate. Daily exchange rate is on their website.